A 53-year-old woman was arrested and charged with driving drunk while riding a horse down a busy Florida highway -- and yes, you read that right. 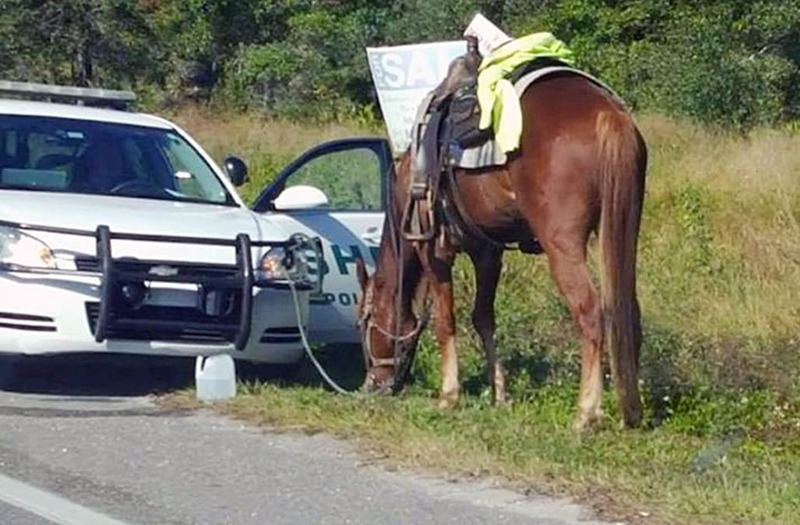 Deputies from the Polk County Sheriff's Office responded to a call about a woman who appeared confused and possibly in danger riding a horse on Combee Road Thursday afternoon, reported the Orlando Sentinel. Authorities arrived at the scene to find Donna Byrne riding the animal in the middle of the road. She had red, watery eyes and reeked of booze, according to Polk County Sheriff’s Office spokesman Brian Bruchey. A field sobriety test revealed that Byrne's B.A.C. was a staggering .161, more than two times the legal limit. Along with the DUI, Byrne was charged with animal neglect for failing to provide proper protective gear for the horse, placing it in jeopardy. NBC News reported that Byrne's prior criminal record includes five felony and ten misdemeanor charges, consisting of cruelty to animals, drug possession, probation violation and criminal traffic. “Ms. Byrne was obviously not in any condition to be on the road," said Polk County Sheriff Grady Judd. "She not only put herself and the horse in danger but also anyone who was driving on the road, which is typically very busy,"
RELATED: Who could forget these celebrity mugshots?